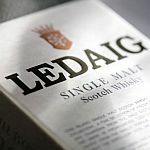 Ledaig Single Malt Scotch is produced at their Tobermory Distillery, the only distillery on the picturesque Hebridean Isle of Mull. It’s name comes from the original name for the area, Ledaig (Led-chig), from the Gaelic, meaning ‘safe haven’. Although not the largest name in the scotch whisky world, their heavily peated taste is one that most whisky drinkers will remember after their initial sample. You can also find some great deals below if you are looking for a bargain.